After a mission and BYU, we were married in 1986. We raised our 3 children in Draper and continue to live in Draper. After work, I enjoy family, mountain biking, Lifetime Fitness, puttering around in the yard, and the family cabin. Rick Mecham has a birthday today. Rick Mecham updated his profile. View. 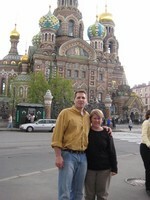 Ronette and I in St. Petersburg this spring. Our family in Mexico last Fall.